The gallery on the Galaxy Tab 3 Lite 7.0 can be sorted into albums, all photos and videos, time, location, etc. Just like in the phonebook, you can choose what kind of content should be displayed - photos and videos from the phone, Dropbox, Facebook or Picasa. You can adjust the thumbnail grid size via a pinch gesture. Upon choosing an album (for instance Camera) you're taken into that album's stack of photos but a swipe to the right will list all albums. In this mode you can browse images in a dual-screen mode and easily select files from multiple folders. You can share an image to any app which supports it straight from the gallery and you also get a nifty thumbnailed list of images at the bottom for faster browsing. There is also a built-in editor. Contextual tags display labels with the location, as well as id the people in the photo and show the date. Then there's the print option, so you can print out photos without going through a computer first (but you'll need a Samsung printer). 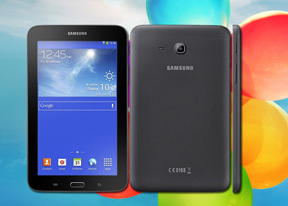 The Samsung Galaxy Tab 3 Lite 7.0 uses the TouchWiz music player. Equalizer presets (including a custom one) are available along with the sound-enhancing SoundAlive technology, which features 7.1 channel virtualization. Music is sorted into categories (Albums, Songs, Playlists, Artists, Genres, Folders, Composers, Years, Music Square, Nearby devices). You can swipe the album art left and right to move between songs. You can also put the phone face down to mute the sound or place your palm over the screen to pause playback. The Galaxy Tab 3 Lite 7.0 player is DLNA-enabled, so you're not limited to tracks on your handset - songs on devices connected to your Wi-Fi network are as easy to get to as locally stored songs. The video player offers several view modes - grid, list, folders and nearby devices (which accesses DLNA devices). Since the Galaxy Tab 3 Lite 7.0 is less powerful than its upper-class contemporaries the video thumbnails aren't animated in the video libary. The video player lets you choose between three crop modes for how the video fits the screen. Dolby Mobile is available in the video player to enhance your audio experience. The video player on the Tab 3 Lite 7.0 supports Pop up play - it moves the video in a small floating window and you can use other apps on the phone while still watching the video. You can use pinch zoom to adjust the size of the video. Sadly chapter preview is also missing from the Galaxy Tab 3 Lite - otherwise it divides videos into chapters so it's easier for users to get around in movies. The video player had absolutely no trouble with any of the files we threw at it - starting with .WMV, through .AVI (DivX and XviD) and .MP4 to .MKV (H.264). The only problem was resolution, most 1080p videos didn't play, mainly due to the chipset limitations. The Samsung Galaxy Tab 3 Lite 7.0 also made a good impression when it offered a list of subtitles and let us pick. 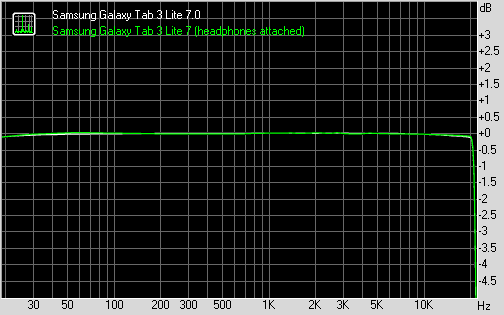 The Galaxy Tab 3 Lite 7.0 scored a Below Average in our loudspeaker test. The speaker on its back sounds very weak and isn't very good for ringing, pink noise or vocal sound representation. It will do for watching YouTube in a quiet environment but not much in a louder setting. Despite its lowly standing in the pecking order, the Samsung Galaxy Tab 3 Lite 7.0 put up a great performance in our audio quality test. The diminutive tablet easily matched the output of its premium siblings from the Pro family, which makes it one of the most gifted musicians around. While the volume levels are only decent in both parts of our test, every single readings we got was excellent. We saw perfectly spotless output when the Galaxy Tab 3 Lite 7.0 was connected to an active external amplifier and next to know degradation when headphones came into play.